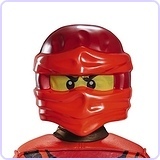 Check out other original Lego costume ideas on our Lego Costumes page. This is the costume that my husband built for our 9 year old son Benjamin. Benjamin is a Lego fanatic and decided that he wanted to be this particular red Lego figure that he had. My husband attached styrofoam to a sonnet tube and carved the helmet. The yellow face is actually a piece of screen that he spray painted yellow and inserted it into the helmet. The body is a box and the legs are foam pants. His "C" hands and ninja sword are made out of PVC piping. My husband spent 4 weekends and quite a few week nights on this costume. I am not sure how much it cost, my husband said he stopped keeping track at $100. It came out great though!!! I think this costume is awesome!!!!!!!! I enjoy having children come to my house for trick or treat in homemade costumes. This is tops. I just LOVE this costume...How unique! What super parents to put the time and effort into this awesome costume..I am sure he will remember this Halloween for EVER!!!! This is totally AMAZING!!! Kudos to all! I have been making costumes for over 20 years I think this shows a true devotion to the spirit of Halloween! Wow! This is an awesome costume! My mom always made my costumes as a kid but I wasn't blessed with her creative genes. O'h my gosh! This is absolutely the best costume I have ever seen for a boy! 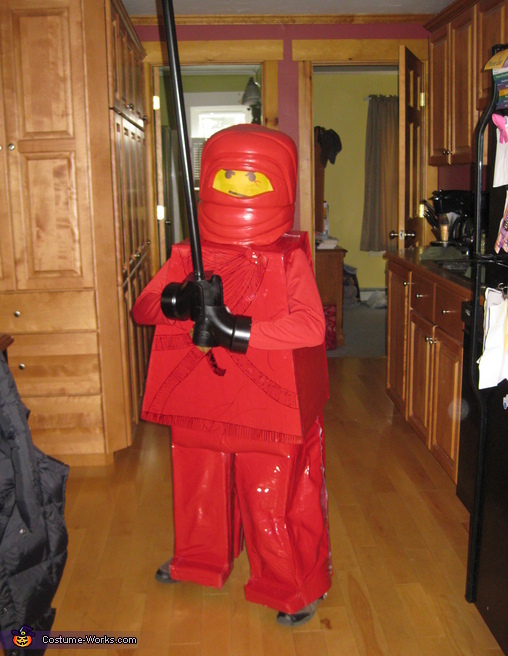 What a lucky boy to have such dedicated and creative parents to put this Lego Ninja costume together for their son! He will remember this Halloween forever! Way to go! I LOVE it! This costume is amazing! Love the creativity in a homemade costume!Legos where apart of my childhood and this costume is just wonderfull!! Love this costume! I've never seen anything cooler!!!!!!!!!!!!!!!!!!!!!!!!! Brian is awesome for being able to create this!! What a great costume! What a lucky boy and talented Daddy too! You guys deserve the win! Legos are all of our all time favorite past time! This costume is fantastic!! I love costumes that show imagination and creativity! This is a winner for sure!! Thank you so much for all of the great comments! We are so excited to share this amazing costume with everyone!! Fantastic costume, my 40 something brother would have worn it if someone would make it in his size! In his defense, he is a lego fanatic too! This is the best lego costume ever!! So creative and what an awesome dad to work so hard! 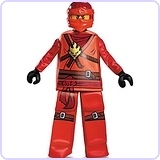 Fabulous red Ninja Lego man ever! Love it! Awesome job!!! You can tell that a lot of time and hard work went into creating this costume. The Lego man idea was very creative and the end result is fabulous and true to the original character. I think this costume is amazing. Such detail and time put into this costume.I wish I had the time and energy to make my kids outfits such as this. Its identical to the Lego man himself. I LOVE this costume!!!! So amazing!!!! How did you make the head? Please & thank you! 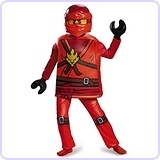 My son is a Ninjago nut and I'm of course looking for costumes of which there are NONE! Em, the costume is pink foam board that my husband attached to a sonet tube (cardboard tube used to hold cement for footings). He cut a hole for the face. Then he spray painted a piece of screen yellow so the whole thing is see through. How do you make the foam pants?